When the first really deep images of M 57 started showing up, I was amazed at the wealth of structure that surrounded the familiar oval that gave the Ring it's name. As it turns out, many planetary nebulae show this kind of layered structure. The explosive events that drive the star's outer atmosphere into space aren't just a one-time event; instead, they can happen repeatedly, producing a set of expanding nested shells. The outer shells are older, farther from the central star, subjected to less intense radiation, more diffuse, and have had more time to cool, all of which means they are less luminous at visible wavelengths. M 57 is quite bright and easy to image. Even the central star, elusive visually thanks to the diminished contrast in the Ring's interior, is easily imaged. But what about those outer shells? Can they be imaged by folks with modest gear? Last night I made my first try at finding out. While waiting for another object to climb out of the trees, I had some time to spend on M 57. I used a C 925 SCT with a 0.63X focal reducer, an SBIG ST-8300M CCD camera shooting through a Baader Ha narrowband filter, and accumulated 39 minutes of 3-minute light frames. That's not very much, compared to some projects where one have a total exposure time of over five hours. But it was all I had time for last night. 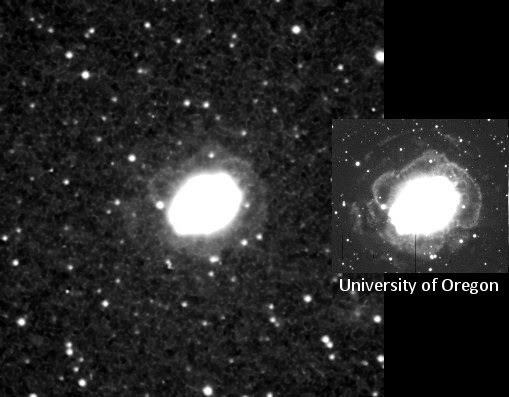 My image is on the left; at right is a deep image from the U of Oregon for comparison. In both images the Ring is wildly overexposed, but you can see the second ring clearly in my 39-minute shot. Also visible are a couple of the brighter knots in the next outward ring. The image scale here isn't the greatest, and only 39 minutes through an Ha filter leaves a lot of noise, but I think it's going to be worth going back to this and shooting for hours. If you haven't tried going deep on M 57, you might give it a try. The result may surprise you, too.